This model has the #4 semi flat rim which is similar to the GR e rim but not as wide overall and has a medium shallow **** cup. This unique high efficiency mouthpiece design has the shallow brighter sounding *** cup and the medium wide semi rounded #3 rim which is similar to the standard GR rim width but with less bite. There is a sufficient amount of what many refer to as "undercut". 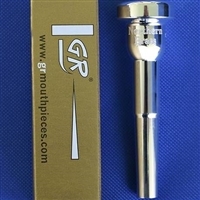 Players who bottom out on mouthpieces like the 13a4a,14a4a and the shallow Shew lead type model mouthpieces often like this model. The big and bright trumpet sound generated by this mouthpiece is truly exceptional. A sizzling sound that soars into the double registers yet remains full in the low and middle registers. Lightning fast response and quick articulations with good sound and intonation. Players who like this model also like the 3-65**** model. Please see the Northern Brass Mouthpieces Description section for more info on the rim and cup styles. Northern Brass 3-65**** Trumpet Mouthpiece .650 inner diameter. The medium shallow **** cup with the comfortable #3 rim which is similar to the standard GR rim width but with less bite.There is a sufficient amount of what many refer to as "undercut". A great choice for those who bottom out on the 13a4a,14a4a the Shew models and similar mouthpieces. Those who like the 3-65*** often add this model to their arsenal for when a darker broader sound is desired yet still efficient enough to tackle the most difficult trumpet literature. GR#1 back bore is used. This model has the #4 semi flat rim that is similar to the GR e rim but not as wide overall and the shallow *** cup. There is a sufficient amount of what many refer to as "undercut" for chop room. A great choice for those who bottom out on the 13a4a,14a4a, or the Shew models and similar shallow mouthpieces. The GR #1 back bore is used for a focused sound and versatility. Those who like this model also like the 4-65****.